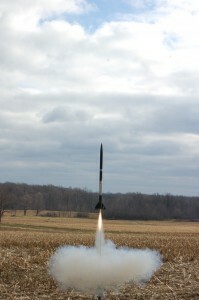 The next Artemis booster, “Nala1” has been undergoing rigorous testing in preparation for its maiden voyage, currently scheduled for Saturday, March 24, 2012. Nala1 will become the first fully operational rocket in the fleet, featuring payload capability of up to 1.5 pounds, fully functional flight computer, and the most powerful motor yet. Nala1 shortly after completion last month. 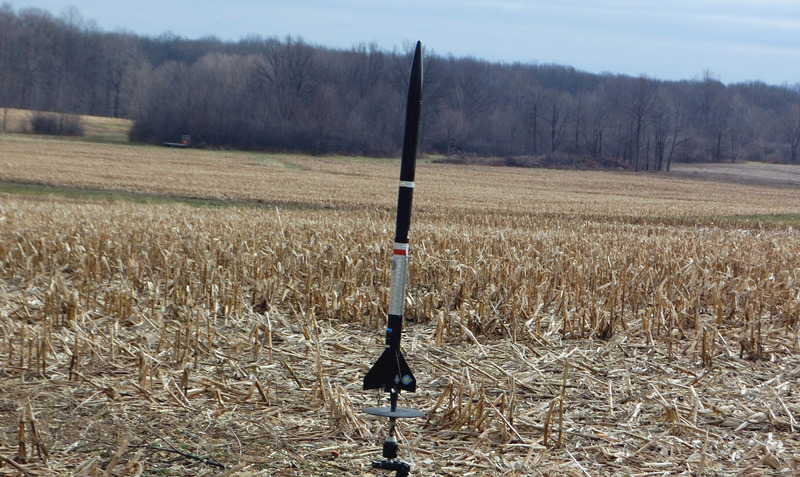 The pre-flight tests include ground testing charges to separate the rocket at apogee (event 1), and deployment of the parachute at the pre-determined altitude (event 2). The plan for the maiden voyage is to carry an on-board camera to an altitude of about 1800 and to verify the aerodynamic characteristics of the booster / payload combination. 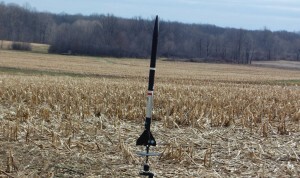 The launch will be my first “rail launched” rocket, and the plan is to launch from one of the MTMA club rail launch pads. By early this summer, missions will take off from launch pad #2, which is specifically designed for rockets from this class to the Nesaru launch vehicle. Most of the tests have been completed, some design changes to the baffle systems were made, and those changes are due to be tested Wednesday (the 21st) Thursday the 22nd. If all goes well, Nala1 will be cleared for launch this Saturday from the O’Reilly field. “Nala1” is named in honor of my longtime pet cat, Nala who passed away about three weeks ago. This is the first fully operational Artemis class booster mission after nearly three years of testing with this design. Nala1 booster being prepped for pressure tests & ground testing for flight event 1. Video of the maiden launch and flight data will be posted within a couple days of launch, stay tuned to my website here for more details! The weather outlook for this weekend’s launch shows a possibility of showers or thunderstorms on Saturday, which may force a delay until Sunday for launch. In the meantime, the countdown has started for a Saturday launch pending the outcome of pre-flight tests & the weather outlook. Well, there isn’t much to say so far. The next launch opportunity is March 10th from the Harmon flying field. 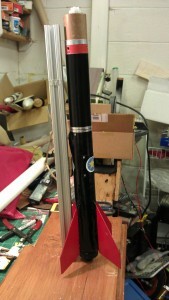 The 29mm Artemis booster for pathfinder is getting closer to completion. This will allow flights up to a “G” motor, and a maximum operational flight range of 2500 feet AGL. 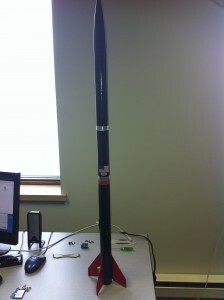 I’m expecting the booster to be ready for flight by spring 2012. As of right now, the wiring for its electrical systems is done, and the booster is being painted. After this, a round of ground tests will begin. Based on the findings of the Artemis / Pathfinder project, I have made several changes to the Nesaru / Adventure launch vehicle (X6-01). The latest of which is a re-designed booster using G-10 fiberglass fins. The current booster will be used for my Level 1 certification attempt, and subsequent flights, and the new booster will be phased in a few months later. A new rocket is in the designing phases right now. It will be based on an entirely new booster named Comanche X-8. This booster will replace the current Perseus and Aurora medium power booster. It will incorporate all the best engineering of the Artemis / Perseus / Aurora rockets, will be Dual Deploy, and designed specifically to operate as a dual deploy rocket to fly from smaller fields such as the MTMA’s summer home, the “Harmon Flying Field”. I have given the rocket the nickname “The Harmon Field Flyier”. Comanche X-8 will be capable of launching electronic & experimental payloads up to around 1/2 pounds. Comanche will fly as a Class 1 rocket, but will have the capability of Class 2 flights at appropriate launch sites. One of the major series of experiments to be conducted using Comanche X8 will be real time electronic telemetry & tracking systems that will be needed in future projects I have in mind, including the Carina Shuttle RC boost glider project. Comanche may take its maiden voyage later on this year. All of these rockets (including the Artemis 29mm booster) are designed around the upcoming Launch Pad 2 rail launcher. 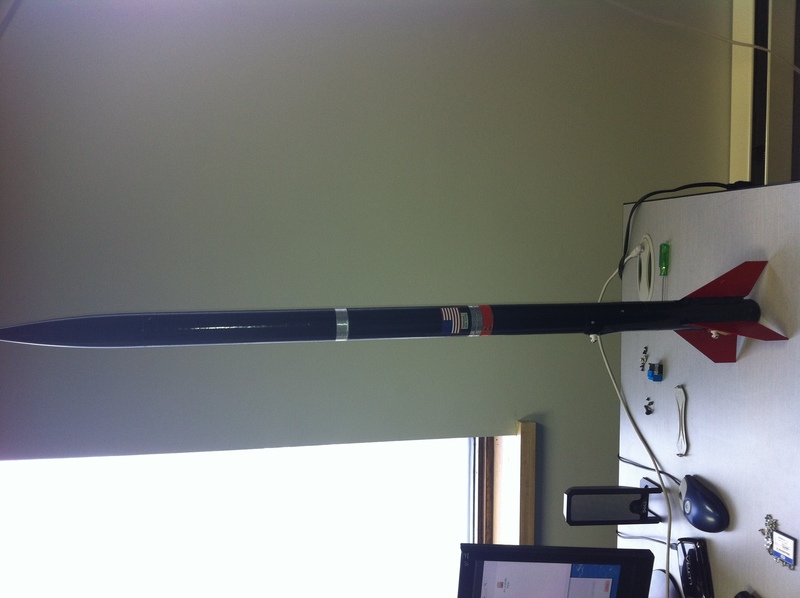 Launch Pad 2 designs are progressing, and construction will begin once the weather is warmer. There is your general update on what’s been going on the past few weeks at Cornelius’ Rocketry Central! Pathfinder / Artemis took to the skies on an Aerotech F-35 white lightning motor — which is (so far) the most powerful motor used on any of my rockets to date. Pathfinder’s top altitude was 1360 feet AGL with a top speed of 320 MPH. A most impressive boost to apogee, where the drogue fired with perfect timing, and Pathfinder started its decent to earth. At 400′, the main parachute was supposed to deploy. That event did not happen, and Pathfinder landed a bit faster than planned, thankfully with minimal damage. rocket has been tweaked several times based test flights of similar systems on board pathfinder. and the first 29mm motor booster flight is set to use a G-64 engine…raising the bar on motor power yet again! The Pathfinder missions are designed as a bridge between my class1 (level 0) launches and the upcoming Class 2 (Level 1) certification launches.